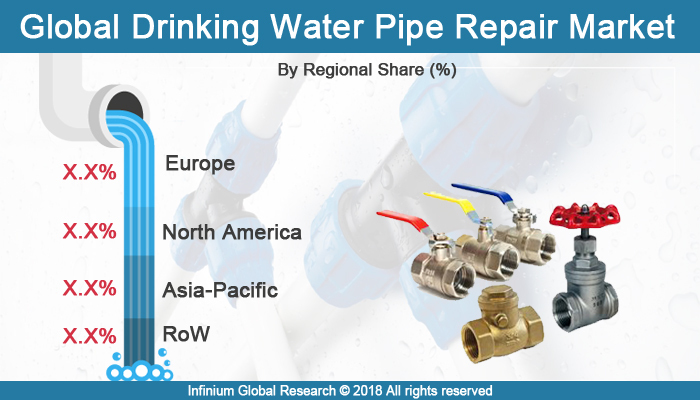 A recent report published by Infinium Global Research on drinking water pipe repair market provides an in-depth analysis of segments and sub-segments in global as well as regional drinking water pipe repair market. The study also highlights the impact of drivers, restraints, and macro indicators on the global and regional drinking water pipe repair market over the short term as well as long term. The report is a comprehensive presentation of trends, forecast and dollar values of global drinking water pipe repair market. According to the report, the global drinking water pipe repair market is projected to grow at a Healthy CAGR over the forecast period of 2018-2024. A water distribution system is an essential feature of social infrastructure that helps water transport, supply, and distribution. Water pipelines play a crucial in transporting and supplying water from one place to another. A huge number of drinking water pipelines all over the world require maintenance and repair. There is a strong need for spending on water infrastructure in order to meet the needs for safe and clean water of an ever-expanding population. Pipes are essential components that connect water sources to various consumers constantly, efficiently and economically. The development of the drinking water pipe repair market is very much dependent on construction activities. Increase in construction activities and population across the world has led to a major rise in demand for the water pipe repair market. Increasing demand for repairing of existing water pipelines is growing the demand for drinking water pipes repair. In addition, construction activities are propelling the demand for drinking water pipes repair. Furthermore, an increase in concerns about public safety increases the awareness concerning about healthy drinking water that impels corporations and local governments to take regular maintenances work of pipeline that is another factor driving the market growth. Execution of strict regulations related to the minimization of leakage and pipe bursts is boosting the drinking water pipe repair market. Hence, the government of several countries is supporting and funding the adoption and development of the latest technology in pipe repair and maintenance. However, on the other side, the high installation cost of pipe repair in underdeveloped countries may be a restraining factor, particularly for small-scale industries with inadequate capital. Moreover, to identify the maintenance work of pipeline sensors are used that helps in providing several growth opportunities for drinking water pipe repair market. Among the geographies, Asia Pacific region is dominating the region for the drinking water pipe repair markets throughout the forecast period. Due to incremental growth in population and rapid urbanisation requirement for strong distribution water pipelines across the various region, that ultimately incites the repair and maintenance work. Furthermore, awareness regarding the preservation of water is boosting the Drinking Water Pipe Repair Market in the Asia Pacific region. The report on global drinking water pipe repair market covers segments such as type, repair technology, and application. On the basis of type, the global drinking water pipe repair market is categorized into pipes & fittings, fittings, couplings, valves, and others. On the basis of repair technology, the global drinking water pipe repair market is categorized into remote assessment & monitoring, open & cut-pipe repair, spot assessment & repair, and trenchless pipe repair. On the basis of application, the global drinking water pipe repair market is categorized into drinking water infrastructure and fresh/potable drinking water infrastructure. The countries covered in the North America region include the U.S., Canada, and Mexico; while the Asia-Pacific region includes countries such as China, Japan, India, South Korea, Malaysia, and among others. Moreover, Germany, U.K., France, Spain, and Rest of Europe are the major markets included in the European region. The U.S. drives the growth in the North America region, as it is the largest market in the region. In the Asia-pacific region, rapid industrial growth in India and China offer a substantial potential for the growth in the drinking water pipe repair market. As a result, the APAC region is projected to experience a growth at a CAGR of x.x% over the forecast period 2018-2024. The report provides profiles of the companies in the global drinking water pipe repair market such as 3M Company, Mueller Water Products, Advanced Trenchless, Inc., Amex GmbH, KMG Pipe Rehabilitation Emirates, Advantage Reline, Kurita Water Industries Limited, Aegion Corp, Agru Kunstofftechnik GmbH, and Affordable Trenchless & Pipe Lining. The report provides deep insights into the demand forecasts, market trends, and micro and macro indicators. In addition, this report provides insights into the factors that are driving and restraining the global drinking water pipe repair market. Moreover, The IGR-Growth Matrix analysis given in the report brings an insight into the investment areas that existing or new market players can consider. The report provides insights into the market using analytical tools such as Porter's five forces analysis and DRO analysis of drinking water pipe repair market. Moreover, the study highlights current market trends and provides forecast from 2018-2024. We also have highlighted future trends in the drinking water pipe repair market that will affect the demand during the forecast period. Moreover, the competitive analysis given in each regional market brings an insight into the market share of the leading players. This report will help manufacturers, suppliers, and distributors of the drinking water pipe repair market to understand the present and future trends in this market and formulate their strategies accordingly.